[CIVIL RIGHTS]. 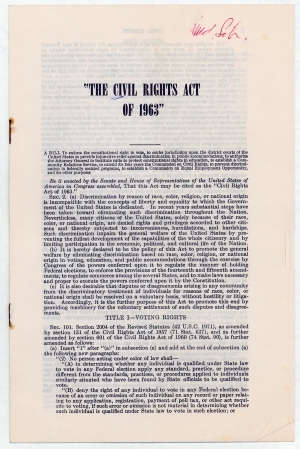 Printed Document, 1963. 11 pp. 5 &frac78; x 9 &frac18; in. The assassination of John Kennedy in November 1963 left most civil rights leaders grief-stricken. Kennedy had been the first president since Harry Truman to champion equal rights for black Americans, and they knew little about his successor, Lyndon Baines Johnson. Although Johnson had helped engineer the Civil Rights Act of 1957, that had been a mild measure, and no one knew if the Texan would continue Kennedy’s call for civil rights or move to placate his fellow southerners. But on November 27, 1963, addressing the Congress and the nation for the first time as president, Johnson called for passage of the civil rights bill as a monument to the fallen Kennedy. ‘Let us continue,’ he declared, promising that ‘the ideas and the ideals which [Kennedy] so nobly represented must and will be translated into effective action.’ Moreover, where Kennedy had been sound on principle, Lyndon Johnson was the master of parliamentary procedure, and he used his considerable talents as well as the prestige of the presidency in support of the bill. On February 10, 1964, the House of Representatives passed the measure by a lopsided 290-130 vote, but everyone knew that the real battle would be in the Senate, whose rules had allowed southerners in the past to mount filibusters that had effectively killed nearly all civil rights legislation. But Johnson pulled every string he knew, and had the civil rights leaders mount a massive lobbying campaign, including inundating the Capitol with religious leaders of all faiths and colors. The strategy paid off, and in June the Senate voted to close debate; a few weeks later, it passed the most important piece of civil rights legislation in the nation’s history, and on July 2, 1964, President Johnson signed it into law.